The Chinese people crave democracy. 1912, the Manchurian Ching Dynasty expired. Sun Yet-San established the Nationalist government. All the same, some died, others fled. Killed the Chinese, also killed the Taiwanese. That old Mao became the leader of China. Revolved around the death toll of 80 million. The entire China, too, afflicted with hundreds of millions. Yet today’s A-Jeou schemes to sell Taiwan to the Chinese Communists. To seize Taiwan’s political estate. To grab Chinese Communists’ political power. Foolish, adrift Chinese become PRC’s slaves. Foolish, adrift Taiwanese become ROC’s slaves. Fine to just to eat till satiation, to live with security? Discussing “human rights,” “democracy,” “liberty,” “lawfulness;” what good is it? People who live in servitude, are they serene and safe? That sort of mentality and cattle, what’s the difference! Since the old days, the Taiwanese people passed days with hardship. Since the old days, the Chinese people chased foods till satiation. Possess the knowledge of human rights. - Taiwanese people finally woke up. In China, the tidal wave of democracy gushes with gusts and gather with clouds. Killed China’s finest without a show of mercy. Yet A-Jeou daydreams about signing peace treaties with the Chinese Communists. Those rolled into meat loafs and grounded into patties, China’s Martyred Spirits of Democracy. 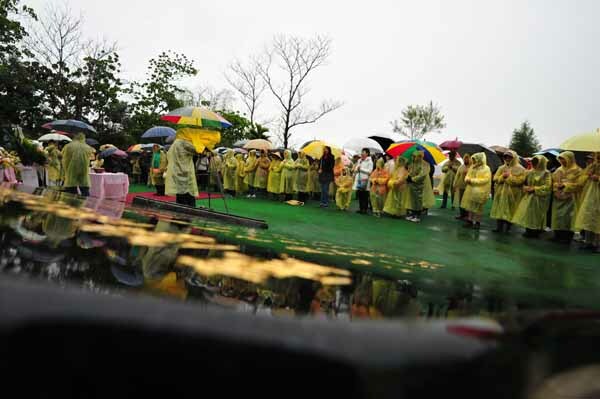 Now They Choose Taiwan 228 Holy Mountain as Their base. Is now shaping China’s growth in democracy. 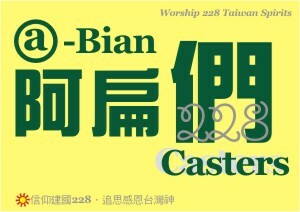 Joined the ranks of 228 Taiwan Divinities. To build, with the world’s core values, democratic nations. Ye who have faith shall remain so. Ye who lack faith shall remain naught. Dear sir, please don’t let those brave souls, who rallied for democracy and freedom twenty years ago, die in vain. In this year of 2009, with the protests in Iran, detainment of Burma’s Aung San Suu Kyi, shut-down of Globovision by Venezuela’s Chavez administration, the struggle for an independent and democratic Taiwan,…just to name a few global events; the fight for democracy must go on. We at Tati will continue to support and advocate for the values so important to continued prosperity of humankind: democracy, freedom, and human rights. Two US lawmakers have submitted a medical report calling for immediate medical parole for former president Chen Shui-bian (陳水扁) to the Tom Lantos Human Rights Commission. “Because it is not easily predictable how much Chen’s incarceration conditions need to improve to prevent further serious physical and mental damage, medical parole is the most appropriate effective treatment intervention,” the report said.